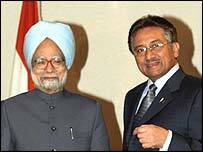 Indian Prime Minister Manmohan Singh has hailed "historic" talks with Pakistani President Pervez Musharraf in New York. It was the first time the two had met since Mr Singh took office in May. A joint statement said the leaders had agreed to explore options to solve the dispute over Kashmir. They also agreed in the "constructive and frank" talks to pursue "normalcy" in relations and discuss a joint gas pipeline project. President Musharraf said: "I hope this augurs well for the future of Indo-Pakistan relations." Mr Singh said: "I feel confident that despite the difficulties on the way, I and President Musharraf will succeed in writing a new chapter between our two countries." The BBC Urdu service's Shahzeb Jillani said the two men's body language at the post-talks conference suggested they had struck a chord and that the meeting had gone very well. The leaders, who have been at the UN General Assembly, had shaken hands warmly before the meeting at a Manhattan hotel. President Musharraf handed Mr Singh a painting and photo of a village near Islamabad where the Indian leader was born, along with a copy of a school report card. Pakistani Information Minister Sheikh Rashid Ahmed said the talks were held "in a very friendly atmosphere". Prior to the meeting, General Musharraf said: "I don't think we are going to sit there and discuss options and then come to a solution.... More important is to judge each other's expectations. "I am very hopeful and optimistic of results. The time to heal wounds is now. The faster the better." Observers said that General Musharraf was trying to inject movement into a peace process, which many people in Pakistan believed was flagging seriously. Manmohan Singh reaffirmed India's commitment to continue peace talks with Pakistan in his speech at the General Assembly on Thursday. 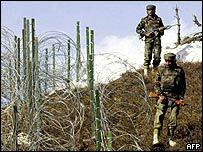 India unilaterally announced some relaxation in granting visas to Pakistanis and President Musharraf has reciprocated by being more restrained and mindful of India's sensitivities on Kashmir while addressing the General Assembly. The Kashmir dispute has been the cause of two wars between the nuclear neighbours. Both Delhi and Islamabad claim Kashmir in its entirety and while nobody believes that personal chemistry alone could ever provide a solution to this dispute, a good relationship between the top leadership limits the threat of war and ensures that the peace process continues, say observers. The future pace of the peace process appears to depend on how the two leaders negotiate the difficult discussions on a seemingly irreconcilable dispute. The difficulties were highlighted on Friday when Indian police said they had killed five separatist militants in Indian-administered Kashmir who, they said, had infiltrated into the area from Pakistani Kashmir. "The two leaders spoke privately for just over an hour"